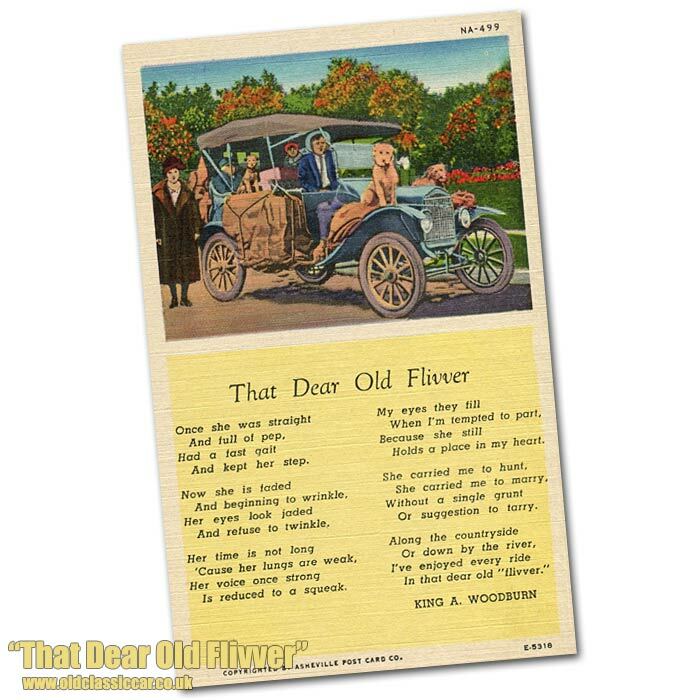 1920's Ford Model T humorous postcards. Homepage. This page: Comic postcards featuring motorists and their Model T tourers, or Tin Lizzies as they were often known. A number of humorous postcards referring to Ford's Model T were produced in the 1920s. This first postcard, printed in England, is franked 1926 and was sent to a Master Donald Fry in London from his father. The card shows a Model T zooming away from its owner, his tools and even his hat sent flying skywards. And the darned thing ran! On the reverse is a red 1 penny stamp. A note printed on the card reminds the sender that: "A half-penny stamp only required if not more than five words of a conventional character are used, together with name and address of sender". I wonder when this idea was dropped? It must have been a nightmare for post office staff to count the words on each and every postcard, to ensure the correct stamp had been used. The stamp is franked with the patriotic reminder that "British Goods Are Best", a little ironic given that the subject of the postcard - an American-designed Model T - is featured on the other side. Many Model Ts were built at Ford's plant at Trafford Park in Manchester though. Flivver, that's a word I'd not encountered before finding this old postcard some time back. Apparently, it's a slang term that dates back to the days when the Model T was a regular sight. Somewhat derogatory, it specifically referred to cars - often Model Ts - that were a bit rough and ready, perhaps worn out, not far from the breaker's yard. In later years, words such as "jalopy" (the original name of this site in its very earliest beginnings) tended to be used in describing cars in parlous condition. Is reduced to a squeak. Holds a place in my heart. In that dear old "flivver". More light-hearted motoring postcards can be found in the humour section. A good number of Model T photographs are presented in the vintage gallery, for instance this selection of Model T tourers, and another group of similar images here also.